GoDot Engine – This is one of the coolest ones in my opinion, but in its current state as I tried it, it was unable to produce a stable WebGL build of one of the simple demo projects. That made it a definite no-go for the Ludum Dare competition. If you want more people to play your game in a compo, you should really have a web version available. People don’t like to have to take the extra step to download, then unzip, then double click to run your game. Games with installers are even less liked (I typically will not review compo game with an installer). Something else that I don’t like about GoDot is that while it is also component-based (which is good IMO), it uses its own made up Python-like language for scripting. Why not just use Python, or a subset of it or something? Love2D – This one is a C++ engine with Lua bindings. While it uses one of my favorite scripting languages, it does not have an editor to help with asset importing or level design. Also, while there are some 3D libraries for it, the engine was not designed with it in mind as far as I’ve been able to determine. Duality – 2D only C#, component-based, Unity-like editor. I haven’t tried this one out, but my general sense it that Unity3d would win this fight. Unreal Engine – A big player in the game engine field. This engine is packed with features and is pretty much free unless you make a game that makes lots of money. Then you have to pay them, but I wouldn’t mind since that would mean I’d raked in lots of dough. My issue with this engine is C++. Yeah I know about the visual Blueprints scripting system, but as a coder, that doesn’t appeal to me. I also don’t want to deal with C++ crud when I’m trying to design a game. C++ is a strange thing for me. I like it, and I hate it at the same time. Every time I do this, I am reminded of how strong the Unity3d ecosystem is. For me, it gives me the most productivity and the widest platform reach with the best tools at this point in time. That doesn’t mean, however that I will stop looking for something better because after all programmers like shiny things. In case you don’t know about Ludum Dare, let me give you a quick run-down of it. It is a Game-making competition that is held 3 times per year where participants have only 48 hours to design a game. The game must be designed around a theme which is revealed at the beginning of the competition after the community votes on 4 rounds themes. Once the competition starts, you have 48 hours to create your game, and all code, sounds, graphics, etc. must be created by you within the 48 hour window. 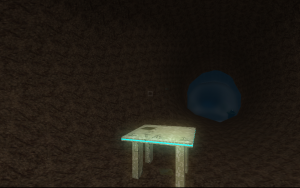 The theme for this Ludum Dare competition ended up being “Beneath the surface”. In addition to that theme, “We must go deeper” was another top vote-getter, so I figured that it was quite possible that one of these two could be chosen. I started thinking about what I might do if one of these themes were chosen. 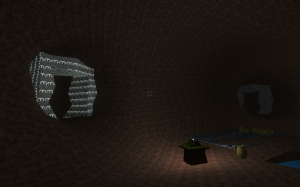 I wanted to do some sort of 3D first-person puzzle game that you get thrown into with little explanation except for the controls. The game’s narrative and plot is revealed through a series of notes that you find throughout the game from someone who was in your same position. I knew this would be one of my biggest project in terms of scope for any Ludum Dare I’ve done (I have entered and completed 15). That turned out to be a bit of an understatement as I took this one down to the wire and a couple of bugs had me quite worried at the end. However, I managed to get it all together and get it submitted before the deadline. 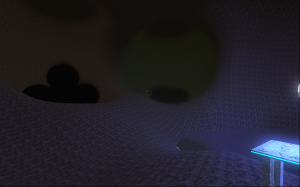 I even managed to throw in some cool image effects which I think add to the experience. 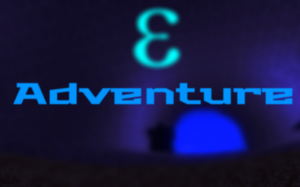 With that, I present to you my most ambitions 48-hour creation to-date: Epsilon Adventure.